From relatively humble beginnings as a DVD-by-mail service, Netflix has grown into one of the most influential media streaming services in the world. The company was one of the first to see the potential of streaming technology and began to transition to a subscription video-on-demand model in 2007. Since this transition, annual revenue has grown from 1.2 billion to over 11.6 billion in just ten years. The number of Netflix subscribers has followed a similar trend, growing from less than 23 million in 2011 to over 130 million in 2018. The service is becoming so popular that an estimated 37 percent of the world’s internet users use Netflix. Although the company’s popularity is booming around the world, the United States continues to serve as the most important market, accounting for 7.2 billion dollars in streaming revenue and 57 million subscribers. Around 59 percent of U.S. based adults had a current Netflix subscription as of 2018, and 70 percent of all adults with a music or video subscription use Netflix. In addition to its massive user base, Netflix subscribers are quite active in terms of viewership; users estimate that they spend almost 36 hours per month using the service. Given these staggering numbers, it may seem hard to believe that other companies could make their mark in the subscription video-on-demand (SVoD) industry, but Hulu and Amazon Prime Video, Netflix’s biggest competitors, have also carved out significant places in the market. 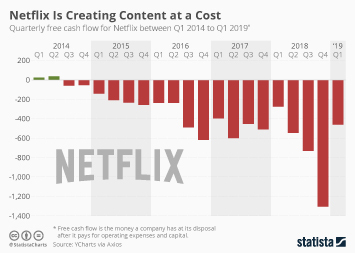 That being said, only 20 percent of Netflix subscribers also subscribe to another video streaming service, ensuring that it remains the clear market leader. One of the main differences between Netflix and its competitors is its massive wealth of original content. The company produced over 300 original content titles in 2017, a number which is only expected to expand in the future. The popularity of shows such as House of Cards, Stranger Things and Orange is the New Black have made original programming integral to the company’s continued success. Over a third of users state that original programs are their most enjoyed content on the entire Netflix platform, and over 60 percent of subscribers state that original shows are either very important or absolutely critical when it comes to their decision to use Netflix. In 2018, Netflix was the highest rated TV network in the United States, with around 77 percent of respondents reporting positive opinions about the service. Consumers aren’t the only people showing their appreciation for Netflix’s content; the network was awarded 23 Primetime Emmy awards in 2018. From the beginning, it was Netflix’s ability to adapt to changing technologies and consumer demands which made it so successful. This ability to adjust has continued in recent years with the success of the company’s original content and increased focus on providing content around the world. As long as Netflix can continue this trend of innovation, the company will remain an important voice in the entertainment industry. Topic: Subscription video on demand market in the U.S.